The nutritional requirements of the human body reflect the nutritional intake necessary to maintain optimal body function and to meet the body's daily energy needs. Malnutrition (literally, "bad nutrition ") is defined as "inadequate nutrition," and while most people interpret this as undernutrition , falling short of daily nutritional requirements, it can also mean overnutrition, meaning intake in excess of what the body uses. However, undernutrition affects more than one-third of the world's children, and nearly 30 percent of people of all ages in the developing world, making this the most damaging form of malnutrition worldwide. The etiology of malnutrition includes factors such as poor food availability and preparation, recurrent infections, and lack of nutritional education. Each of these factors is also impacted by political instability and war, lack of sanitation, poor food distribution, economic downturns, erratic health care provision, and by factors at the community/regional level. In developing nations, more than half of all deaths among children under five years old are due to malnutrition. Malnourished children who survive may experience stunted growth, illness, and lifelong malnourishment. and pregnant women, have higher nutritional needs than others, and are therefore more susceptible to the effects of poor nutrition. Those living in deprived socioeconomic circumstances or that lack adequate sanitation, education, or the means to procure food are also at risk. Most importantly, individuals at risk for systemic infections (particularly gastrointestinal ) and those who suffer with a chronic disease are at greatly increased risk because they require additional energy to support their immune system and often have decreased absorption of nutrients . In fact, the relationship between malnutrition and infection is cyclical—infection predisposes one to malnutrition, and malnutrition, which impairs all immune defenses, predisposes one to infection. The World Health Organization (WHO) identifies malnutrition as "the single most important risk factor for disease" (WHO). Some research has identified malnourished children as being more likely to suffer episodes of infectious disease, as well as episodes of longer duration and greater severity, than other children. In particular, hookworm , malaria , and chronic diarrhea have been linked with malnutrition. These conditions are more prevalent in the developing world than in the industrialized world, though malnutrition exists worldwide, particularly in areas of poverty and among patients with chronic disease or who are hospitalized and on enteric feeding. The WHO's Department of Nutrition for Health and Development is responsible for formulating dietary and nutritional guidelines for international use. Adequate total nutrition includes the following nutrients: protein , energy ( calories ), vitamin A and carotene, vitamin D , vitamin E, vitamin K, thiamine, riboflavin, niacin , vitamin B6, pantothenic acid, biotin , folate , vitamin C, antioxidants , calcium , iron , zinc , selenium, magnesium, and iodine. Most important are protein and the caloric/energy requirement needed to utilize protein. If these elements are inadequate, the result is a protein-energy malnutrition (PEM), or protein-calorie malnutrition (PCM), which affects one in every four children worldwide, with the highest concentration in Asia. 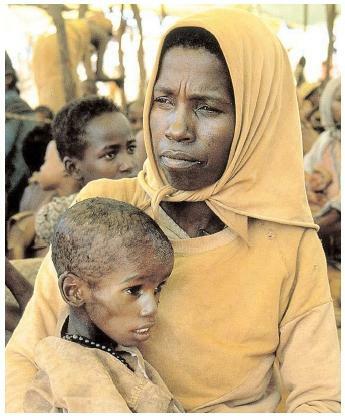 Chronic deficiencies of protein and calories result in a condition called marasmus , while a diet high in carbohydrates but low in protein causes a condition called kwashiorkor . 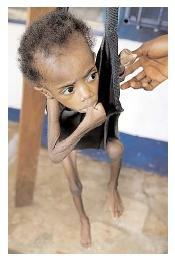 Malnutrition from any cause retards normal growth. Growth assessments are therefore the best way to monitor a person's nutritional status. While there are a variety of methods used to measure growth, the most common are known as anthropometric indices, which compare an individual's age, height, and weight, each of which is measured against the others. The values are expressed as percentages, or percentiles, of the normal distribution of these measurements. So, for example, a child with a given height and age might rank in the 90th percentile for height based on all children of that particular age, meaning that 90 percent of children that age are shorter than this particular child. Through anthropometric studies, researchers have found that particular measurements correlate with specific growth trends, based on how the body normally changes over time. Abnormal height-forage (stunting) usually measures long-term growth faltering. Low weight-for-height ( wasting ) correlates with an acute growth disturbance. Malnutrition can have severe long-term consequences. Children who suffer from malnutrition are more likely to have slowed growth, delayed development, difficulty in school, and high rates of illness, and they may remain malnourished into adulthood. Limited growth patterns are distributed unevenly across the globe. Eighty percent of children affected by stunting or wasting live in Asia, with 15 percent in Africa and 5 percent in Latin America. Low weight-for-age (underweight) is usually used as an overall measurement of growth status. More than 35 percent of all preschool-age children in developing countries are underweight. There are differences, however, across regions. "The risk of being underweight is 1.5 times higher in Asia than in Africa, and 2.3 times higher in Africa than Latin America" (Onis, p. 10). In some ways, these indices also enable an indirect understanding of the societal factors in these regions that contribute to malnutrition as mentioned above. The Universal Declaration of Human Rights, established by the United Nations (UN) in 1948, identifies nutrition as a fundamental human right. An acutely malnourished Liberian boy is weighed at a therapeutic feeding center. Such centers, operated by international relief organizations, provide intensive care and a specialized diet to rehabilitate severely malnourished children. Malnutrition remains one of the world's highest priority health issues, not only because its effects are so widespread and long lasting, but also because it can be eradicated. Given the multifactorial causes of malnutrition, interventions must be focused on both acute and broad goals. Current efforts are targeted at high-risk groups, particularly infants and pregnant women, for it is "in these populations and during these ages that nutritional interventions have the greatest potential for benefit" (Schroeder, p. 46). Even the simple supplementation of vitamin A or beta-carotene supplements during pregnancy can decrease maternal mortality by 40 percent. Interventions include direct food supplementation, food access, agricultural enrichment , nutritional education, and improved infrastructure related to hygiene , sanitation, and health care delivery. Each of these programs "must be tailored to the particular problems, cultural conditions, and resource constraints of the local context" (Schroeder, p. 417). Strategies for reducing the prevalence of malnutrition must effectively address its many causes. SEE ALSO Kwashiorkor ; Marasmus ; Nutrients ; Nutrition . Gillespie, Stuart, and Lawrence Haddad (2001). Attacking the Double Burden of Malnutrition in Asia and the Pacific. Washington, DC: International Food Policy Research Institute. Onis, M.; Monteiro, C.; Akre, J.; and Clugston, G. (1993). "The Worldwide Magnitude of Protein-Energy Malnutrition." In Bulletin of the World Health Organization 71(6). Schroeder, Dirk G. (2001). "Malnutrition." In Nutrition and Health in Developing Countries, ed. Richard Semba and Martin Bloem. Totowa, NJ: Humana Press. Shannon, Joyce Brennflck (2001). Worldwide Health Sourcebook. Detroit, MI: Omnigraphics.